This award provides funding for a study that seeks to identify the role of the endocannabinoid system in rheumatoid arthritis. The endocannabinoid system is a group of cannabinoid receptors that reside in the brain and nervous systems. Cannabinoid receptors are involved in physiological processes such as appetite, pain sensation, mood, and memory. The researchers’ hypothesis is that a protein known as IL-1 beta induces pain and inflammation by altering expression levels of the two main endocannabinoid receptors, CB1 and CB2, in rheumatoid arthritis synovial fibroblasts. Rheumatoid arthritis synovial fibroblasts are a type of cells that distinguish rheumatoid arthritis from other conditions involving inflammation. This study will provide new insights into how endocannabinoids influence disease progression in rheumatoid arthritis and may lead to the development of new therapies for the disease. This grant funds WSU’s help with the implementation of the Collaborative Learning for Educational Achievement and Resilience (CLEAR) trauma-informed school response model in four elementary schools under Kaiser Permanente’s Thriving Schools initiative. Developed by the WSU Child and Family Research Unit (CAFRU), CLEAR is a whole-school change model that helps school professionals gain the skills needed to support students who have experienced trauma (such as abuse, neglect, homelessness, and domestic violence) and to enhance social emotional learning. A trauma specialist will work with each school for two days each month over three years to engage school staff and leadership in this professional development model, progressively building trauma expertise and aligning it with school instructional and student support practices. Expected outcomes include increased staff skills, improved school climate and staff wellbeing, reduced staff turnover, decreased disciplinary concerns, and improved academic outcomes for the whole school. This award provides funds for WSU Child and Family Research Unit (CAFRU) staff to train local professionals from Options for Southern Oregon and the Grants Pass School District in the implementation of the CLEAR (Collaborative Learning for Educational Achievement and Resilience) model. Two Options for Southern Oregon staff will deliver the CLEAR trauma-informed school response model in three schools in the Grants Pass School District during the 2017-2018 school year. Grants Pass School District staff will attend the training to build oversight and integration skills in use of CLEAR principles, but will not be delivering the model. This award funds the implementation of Collaborative Learning for Educational Achievement and Resilience (CLEAR) trauma-informed school response model in the Grants Pass School District’s Gladiola Campus in southwestern Oregon. Developed by the WSU Child and Family Research Unit (CAFRU), CLEAR is a whole-school change model that helps educators and other school professionals recognize, understand, and deal with the effects of children’s exposure to harmful experiences, such as abuse, neglect, homelessness, and domestic violence. Implementation of CLEAR will be done through on-site monthly consultation and professional development trainings provided by CAFRU staff. This is a sub-award that funds Naomi Chaytor’s role as co-principal investigator of a study led by the Jaeb Center for Health Research Foundation. That study will test the impact of the use of continuous glucose monitoring (CGM) on health outcomes and quality of life in older adults with Type 1 Diabetes. CGM allows for real-time monitoring of glucose levels and alarms when glucose drops to low levels, which is known as hypoglycemia. Hypoglycemia is associated with increased risks for falls leading to fractures, car accidents, and abnormal heart rhythms. Despite the benefits provided by CGM, only a small of older adults with Type 1 Diabetes use it. This new study involves a randomized controlled trial of approximately 200 participants aged 60 or over with Type 1 Diabetes at 20 clinical sites, who will be assigned to either the CGM group or a group that receives usual care without CGM. Chaytor is responsible for measuring cognitive and quality of life outcomes of the study. This new project will validate the use of a self-administered online neurocognitive assessment (www.testmybrain.org) as compared to gold standard neuropsychological measures administered through in-person testing. The study attempts to address barriers to including neurocognitive assessment in clinical trials. This includes logistical challenges related to in-person test administration, which reduces inclusion of participants in rural areas who are underrepresented in clinical trials. The results from this study will make routine assessment of neurocognitive outcomes in clinical trials possible, leading to new insights into neurocognitive effects and intervention mechanisms that would have otherwise been undetected. This is a new five-year grant to fund the operation of an existing Economic Development Administration (EDA) University Center at WSU. Based in Spokane, the WSU University Center for Innovation makes available university resources to the public to promote economic development in Washington State, North Idaho, and northern Oregon. It cultivates innovation and supports commercialization by providing technical assistance to small businesses and startups; conducting applied research on the market viability of products and services that drive small businesses; and assisting distressed areas within its region by identifying areas of potential economic development and helping to develop that potential into sustainable jobs. Under this new grant, the University Center for Innovation will work with other organizations in the region—such as the WSU Vancouver Business Growth Mentored Activity Program—to provide services to help new businesses form and create new jobs. The purpose of this grant is to develop a new mouse-based model of studying sleep-dependent changes in ocular dominance plasticity. Ocular dominance plasticity is a form of brain plasticity triggered by monocular deprivation, which involves depriving an animal of sight in one eye during a period of high plasticity. Earlier studies have shown that ocular dominance plasticity is enhanced by sleep. The new model will allow the principal investigator to more completely identify the underlying mechanisms and the brain states in which they occur. This work will provide the foundation for future studies of how experience and sleep shape the developing brain. As part of this project, WSU researchers will help the Washington State Center for Court Research conduct a research study about the prior education experience and outcomes by type or duration of juvenile detention exposure, prior to or following sentencing. The study is part of a larger effort funded by a four-year, $7 million grant given to the Washington Office of Financial Management’s Education Research and Data Center in partnership with the Office of the Superintendent of Public Instruction to enhance current capabilities to use data in the statewide longitudinal data system. This is a contract with the City of Spokane for WSU’s assistance in providing a process and outcome evaluation of the newly implemented Spokane Community Court, which uses a collaborative, problem-solving approach to address low-level crimes in the downtown area. The principal investigator will look at how cases are processed and barriers are addressed; examine participant outcomes as compared to a control group; and obtain data from secondary agency records to come up with recommendations for current and future community court efficiencies. This contract funds WSU efforts to conduct research and collect data to create and validate a set of tools to evaluate offender risk known as the Spokane Assessment for Evaluation of Risk (SAFER). As part of this work, the principal investigator will construct draft probation and jail screening tools. This research project is aimed at better understanding the underlying causes of abnormal sleep by determining the cellular mechanisms involved in sleep homeostasis, the process that regulates the pressure to sleep based on prior wakefulness. Impaired sleep homeostasis can cause poor sleep, a problem that poses significant clinical and economic impacts. Using a mouse model, this study will employ advanced imaging and microscopy techniques to test the hypothesis that intracellular calcium dynamics between neurons and glial cells contribute to the buildup and discharge of sleep need. Building on recommendations for research in Native communities and previously conducted cultural research for decreasing substance and alcohol misuse, this project will identify strength-based community meanings of resiliency and purposefulness through traditional story-telling with Alaska Native peoples and determine its influence on substance abuse as defined by an Alaska Native community. Other project goals include recording culturally centered stories of resiliency and purposefulness that can be used for educational materials related to health and wellness and developing and implementing a culturally tailored educational tool for community health nurses and students. This grant provides funding for WSU researchers to create an online training for law enforcement officers related to the health and safety risks of shift work and long hours. As part of this project, the researchers will review an existing online training program for nurses and make recommendations for tailoring its content for law enforcement; produce audio/video segments and photographic images to incorporate into the program; provide narration for selected parts of the program; and conduct two focus groups in California to solicit feedback from law enforcement on the draft training content. This grant funds a fellowship program that complements and extends the work of the Collaborative on Health Reform and Independent Living (CHRIL), a multisite Disability and Rehabilitation Research Project funded by the National Institute on Disability, Independent Living and Rehabilitation Research. The program will fund three postdoctoral research positions for individuals with disabilities who are personally committed to understanding and improving health policies and services for disabled Americans. The goal is to have these students go on to faculty positions at major universities or leadership roles in federal research agencies and nonprofit foundations. This grant funds a clinical study to determine the efficacy of using hyperbaric oxygen to relieve signs and symptoms of opioid withdrawal in human subjects who are undergoing opioid dose reductions or are on opioid tapering plans. Subjects will be recruited from the Spokane Regional Health District Opioid Treatment Program. They will be randomized into two groups—a group that will receive a five-day medically supervised hyperbaric oxygen treatment and a control group. Preliminary data from this study will used to apply for funding for a larger clinical trial to test the efficacy of hyperbaric oxygen in relieving opioid withdrawal in humans. This is a five-year, competitive renewal award for a project to determine whether modifications to an intervention known as contingency management—which uses incentives to reward positive behavior—can improve outcomes and reduce costs in heavy drinkers with serious mental illness. Using ethyl glucuronide (EtG) urinalysis to measure abstinence, a previously conducted randomized 12-week contingency management trial found that contingency management participants were three times more likely to test negative for alcohol than controls and also found lower levels of heavy drinking, stimulant drug use, and cigarette smoking. However, contingency management was ineffective for participants with an average pre-treatment EtG level that indicated frequent, recent heavy drinking. This study will investigate whether outcomes can be improved by increasing the value of incentives used in the intervention or by rewarding light drinking before rewarding abstinence. This is a five-year grant for a research study aimed at describing the relationship between the nervous system and the innate immune system in response to pathogen infection. The study uses a model organism known as C. elegans, a roundworm that has a simple, well-defined nervous system and an immune systems that resembles that of humans in key respects. Earlier work completed by the principal investigator in this area has found that a neurotransmitter known as octopamine works with specific proteins and neurons to suppress the innate immune response. This project will try to dissect the neuronal and molecular mechanisms that make up this immuno-inhibitory pathway. This work could lay the groundwork for new treatments for human health conditions linked to excessive immune responses, such as Crohn’s disease, rheumatoid arthritis, diabetes, and Alzheimer’s disease. This award provides funding for upgraded equipment for the Spokane-based laboratory facilities that are used to conduct human fatigue and performance research in warfighters and others who work long hours or odd shifts in mission-critical environments. Equipment to be purchased includes computer upgrades for the lab’s sleep recording system; skin conductance recording devices to measure physiological responses during fatigue; hardware upgrades and a scenario management workstation for the lab’s full-immersion use-of-force simulators; goggle-mounted eye tracking devices; and data storage space expansion. The new equipment will help sleep scientists enhance current laboratory studies and pursue new research directions to better understand and mitigate the effects of fatigue on human performance. This is a four-year competitive renewal R01 award for a research study aimed at unraveling the mechanisms by which telomerase is regulated during development. Telomerase is an enzyme that lengthens telomeres in DNA strands, which allows cells to become immortal. It plays a key role in cell aging and tumor progression. This study will look at the gene that encodes a component of telomerase known as hTERT and how the gene is repressed during cell differentiation (the process by which a less specialized cell becomes a more specialized cell type). The goal of the study is to determine how telomere homeostasis contributes to human aging and the formation of tumors. This award provides renewal funding for the implementation of Collaborative Learning for Educational Achievement and Resilience (CLEAR) trauma-informed school response model at Lincoln Elementary in the Grants Pass School District in southwestern Oregon. Developed by the WSU Child and Family Research Unit (CAFRU), CLEAR is a whole-school change model that helps educators and other school professionals recognize, understand, and deal with the effects of children’s exposure to harmful experiences, such as abuse, neglect, homelessness, and domestic violence. Implementation of CLEAR will be done through on-site monthly consultation and professional development trainings provided by CAFRU staff. This is continued funding for a five-year grant to establish—in partnership with the University of Colorado Denver—a new collaborative research center aimed at reducing health risks related to high blood pressure in U.S. Native populations. The center will draw in expertise and solicit input from community organizations, tribes, and researchers across the country to pursue intervention studies that will use technologies, including electronic medical records, text messaging, wearable physical activity monitors, and home blood pressure monitors. This is supplemental funding for an NIH center grant sub-award that establishes a satellite core of the Alzheimer ’s Disease Research Center in Seattle. The WSU team will provide assistance in this project, which will recruit participants of the Strong Heart Stroke Study to examine Alzheimer’s disease and its consequences in about 100 elder American Indians. The Strong Heart Stroke Study is a follow-up study to the Strong Heart Study, a large longitudinal cohort study examining cardiovascular disease and its risk factors in American Indians. This grant funds the continuation of a project to adapt an existing diet intervention designed to reduce high blood pressure for use in Native populations and disseminate it to health professionals, with the goal of reducing Native patients’ health risks related to high blood pressure. Partners in this project include the Fred Hutchinson Cancer Research Center’s Division of Public Health Sciences, the University of Oklahoma Health Sciences Center, the Indian Health Resource Center of Tulsa, Native Health of Spokane, and MedStar Health Research Institute Laboratory. This is continued funding for a discovery center to study the underlying causes of urologic chronic pelvic pain syndromes. The center collaborates in the Multi-Disciplinary Approach to the Study of Chronic Pelvic Pain (MAPP) Research Network. The goal of the center is to conduct multidisciplinary, multi-site, basic, translation, and clinical research on urologic chronic pelvic pain syndromes. This is continued funding for a study of the potential role of CST protein complex in preserving genome stability. Genome stability is threatened by environmental exposure to genotoxins, which stress and sometimes stall the process by which DNA replicates. This can lead to damage in the form of a high frequency of changes and rearrangements of DNA sequences in cells—known as genome instability—which can lead to cancer and has also been linked to certain neurodegenerative diseases. Recent studies have shown that deficiencies in the CST complex—which consists of three genes known as Ctc1, Stn1 and Ten1—impair the restarting and repair of stalled DNA replication. The hypothesis of this study is that CST may somehow help facilitate replication and prevent breakage of DNA in fragile sites. The study may provide new insights into how cells counteract DNA damage caused by genotoxin-induced replication stress and has the potential to lead to improved screening for diseases linked to mutations in the genes in the CST complex, including type 2 diabetes, heart disease, pulmonary fibrosis and two rare conditions with aging-related symptoms—Coats plus syndrome and dyskeratosis congenita. This is a continuation of funding for research aimed at reducing the toxicity to the heart of certain chemotherapy drugs, including doxorubicin. Common side effects of these anti-cancer drugs include life-threatening conditions such as cardiomyopathy and heart failure. 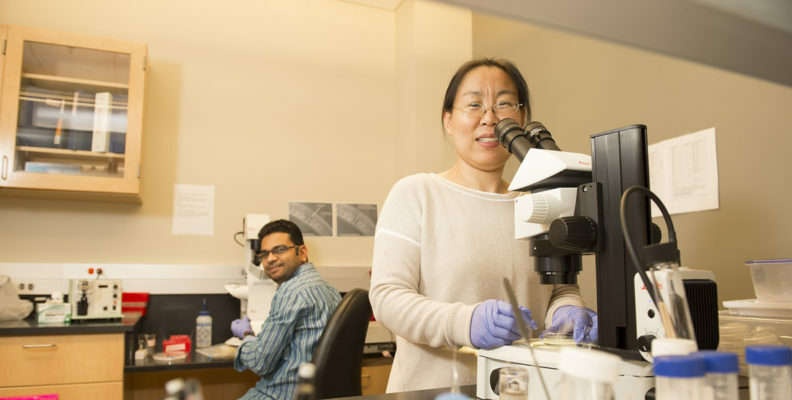 Cheng will be studying how a protein known as cyclin-dependent kinase inhibitor p21 may reduce the cardiotoxicity of doxorubicin by preventing cell death in cardiac muscle cells. This is continued funding for a study of the potential role of gliotransmission—chemical signaling between glia and neurons in the brain—in sleepiness and impaired cognitive functioning after sleep loss. The study could contribute to new ways to combat excessive daytime sleepiness and insomnia, as well as attention, learning, and memory problems associated with sleep loss. This award provides supplemental funds for a previously awarded research project. The four-year study follows up on an earlier discovery by the principal investigator that there is a relationship between increased GABA (gamma-aminobutyric acid—the primary central inhibitory neurotransmitter) and abnormal mTOR signaling. The mTOR protein is key for controlling autophagy, a normal physiological process that deals with destruction of cells in the body. As part of this work, it was found that rapalogs—a class of anticancer drugs that inhibit mTOR—could be used to override the negative effects associated with increases in GABA, which include toxicity to the eye. The discovery could have implications for patients who have heritable disorders of the GABA metabolism—such as GABA-transaminase (GABA-T) or succinic semialdehyde dehydrogenase deficiency (SSADHD)—or elevated levels of GABA resulting from the use of the antiepileptic drug Vigabatrin, which inhibits the breakdown of GABA. This study will test, in a mouse model, the hypothesis that autophagic pathways involving GABA and mTOR can be mitigated with rapalog medications and assess the effectiveness of those drugs at mitigating ocular toxicity. The supplement pays for the use of additional advanced techniques to examine ocular toxicity, in collaboration with the University of Wisconsin-Madison’s McPherson Eye Research Institute. This is renewal funding for the research partnership between the Washington State Department of Corrections and the WSU Department of Criminal Justice and Criminology. The contract provides for joint funding of a PhD-level graduate research assistant to manage, organize and prepare data to support research projects and to respond to grant solicitations as they evolve, based on the parties’ collaborative efforts. This renewal award funds WSU’s assistance in creating and validating a series of models to assess the risk of re-offense for felons convicted and sentenced in the state of Washington. This award provides renewal funding for a PhD in Criminal Justice student to help the WSU Department of Criminal Justice and Criminology conduct collaborative research with the Oregon Youth Authority. The Oregon Youth Authority oversees juvenile offenders who are incarcerated or on probation or parole in the community and provides medical and psychiatric care and other services and support to delinquent youth. This is supplemental funding for a project that provides nutrition education and obesity prevention services to individuals and families eligible for Supplemental Nutrition Assistance Program (SNAP) assistance in Spokane County. This is continued grant funding for a project to create a Collaborative on Health Reform and Independent Living. The collaborative brings together disability advocates and researchers from WSU and three other institutions to evaluate the impact of the 2010 Patient Protection and Affordable Care Act on the physical, psychological, and economic well-being of working-age adults with disabilities. The researchers will analyze data from existing surveys as well as conduct new phone and Internet-based surveys to gather data from health care consumers with disabilities and directors of Centers of Independent Living. Partner institutions in this project are the University of Kansas, George Mason University, and the Independent Living Research Utilization program at TIRR Memorial Hermann Hospital. These continued grant funds are provided to study tumor necrosis factor (TNF) alpha, a well-known sleep-regulatory substance. This study will explore the underlying mechanism of how TNF signals to induce emergent state properties in cultures of glia and neurons. This awards funds the continuation of a study of the use of a culturally acceptable contingency management intervention to encourage and support abstinence from alcohol abuse among American Indians and Alaska Natives. The study covers individuals from three tribes living on two reservations who receive services at an urban Indian health care facility. Contingency management is an intervention that uses incentives to reward positive behaviors. This is supplemental funding for a grant that supports the Pacific Northwest Node of the NIDA Clinical Trials Network (CTN). The Pacific Northwest Node is a multi-institution, multiple principal investigator effort to continue CTN’s mission to improve the quality of drug abuse treatment throughout the country through science. This is a funding increase for a study of the effectiveness of the Caring Contacts approach as a way of reducing suicidal ideation, suicide attempts, and suicide‐related hospitalizations among Native American young adults. A recent study has found that suicide rates for Native American young adults in the Northern Plains and Alaska are much higher than those for white Americans in the same regions. The Caring Contacts approach uses text messages expressing care, concern, and interest to supplement standard suicide prevention. In a randomized, controlled trial, this study will compare the use of the Caring Contacts approach as a supplement to usual suicide prevention care versus usual care only in at‐risk Native American young adults. This award represents a funding increase for a grant that funds the first conference in a proposed annual conference series on health and health care for American Indian and Alaska Native elders living in urban areas. The goal of the series is to stimulate research that will address the current gap in knowledge on Native elders living in urban areas and inform the allocation of health care resources for programs responsive to the needs of urban Native elders. Most research on Native health has been conducted in rural and reservation communities, even though 71 percent of American Indians and Alaska Natives live in urban areas. Native populations are at elevated risk of obesity, smoking, substance abuse, diabetes, cardiovascular disease, traumatic injury, and other health issues. The gap in knowledge about urban Native populations is particularly concerning in the case of Native elders (those 65 and older), whose risk profiles and health care needs are likely to differ substantially from their rural counterparts. The two-day conference will be held in Seattle in July 2017. This is third-year renewal funding for the founding of a multidisciplinary Center of Excellence on Natural Product-Drug Interactions Research in conjunction with researchers at four other institutions. WSU was previously involved through a subcontract with the University of Washington, but with this renewal has become the lead institution on the grant. The goal of the center is to create a roadmap for best research practices on how to study potential unwanted interactions between natural products and conventional medications. The center comprises four cores: administrative, pharmacology, analytical, and informatics. The team will work with the National Center for Complementary and Integrative Health (NCCIH) officials to identify a priority list of natural products that could affect the efficacy and safety of conventional medications by altering drug distribution and elimination in the body; identify hurdles to studying these interactions; propose approaches to overcoming these challenges; develop a Web portal that will allow other researchers access to data for further analysis; and communicate health implications of findings to the public. This grant provides continued funding for a program to provide students pursuing health professions degrees on the WSU Spokane Health Sciences campus with training to recognize and treat substance use disorders as part of their clinical experiences. The program will provide training to health professions students in a variety of disciplines, including students in WSU’s nursing, pharmacy, nutrition and exercise physiology programs; EWU’s occupational therapy and social work program; and UW’s MEDEX physician assistant and WWAMI medical education programs. This is continued funding for a project to develop the Strong Men, Strong Communities program. The program provides a culturally appropriate approach to reducing the risk of diabetes in American Indian men, who experience type 2 diabetes at much higher rates than other racial and ethnic groups in the U.S. The investigators will study the effectiveness of the intervention in three American Indian communities—the Seneca Nation (New York), Mille Lacs Band of Ojibwe (Minnesota), and the Indian Health Board of Minneapolis (Minnesota)—as compared to waitlisted control groups. This is a continuation award for a WSU-led substudy of a University of Washington research project to evaluate the efficacy of self-hypnosis and mindfulness meditation training to treat chronic pain in veterans. The substudy will investigate the relationship between sleep and pain to determine whether improved sleep early in the course of treatment improves pain and sleep outcomes later. The study will follow 135 veterans enrolled in the parent study and will collect sleep measurements through wristband sleep monitoring devices and sleep surveys for one week just before their intervention, immediately afterward, and three months post-intervention. The study will increase scientists’ knowledge of the relationship between sleep and pain and could be a first step toward the development of sleep-based interventions to help alleviate chronic pain. This is supplemental funding for a sub-award of a Centers for Disease Control grant awarded to the Spokane Regional Health District under the “State and Local Public Health Actions to Prevent Obesity, Diabetes, and Heart Disease” program (DP14-1422). The goals of the program are to improve environments in worksites, schools, government agencies and community settings to promote healthy behaviors; improve delivery of service to prevent and manage high blood pressure and diabetes; and increase community linkages to support prevention, self-management and control of diabetes, high blood pressure and obesity. The WSU College of Pharmacy will support these goals by developing community partnerships; implementing interprofessional education and community outreach for diabetes and high blood pressure screening and education; and increasing the engagement of community pharmacists in patient self-management of high blood pressure to meet treatment targets.